Andy Rubin is best known as the guy who created Android, sold it to Google, and nurtured it into the most popular smartphone operating system on the planet. But Rubin left Google back in 2014, and now he’s on his own. His latest gig is Essential, a startup he runs as CEO that’s trying to become a new kind of gadgets company. It starts with a phone, called the Essential PH-1, and the plan is to expand into smart appliances and cars from there. Rubin spoke Wednesday at the Wired Business Conference in New York and shed a bit more light on Essential’s plans. After the Essential Phone launches this summer, the company plans to release Home, a voice-controlled hub for all the connected appliances in your house. Rubin claims Home will be compatible with the wide variety of smart home platforms, ranging from Apple’s HomeKit to Samsung’s SmartThings, even though it’d take a wild level of technical wizardy to pull it off. Many are skeptical he can pull it off. He calls this new platform Ambient OS. Beyond that, Rubin teased that he’d like Essential to tackle the car, which is increasingly coming into focus as an area of growth for tech companies. And questions remain how the Essential Phone, which costs $699, can find success in a market dominated by Apple and Samsung. Steve Kovach: I want to talk more about Ambient OS. You were talking a lot about how you’re really confident you’re going to be able to stitch all these various platforms together. Andy Rubin: I didn’t say I was confident. I’m definitely going for it. Kovach: If I’m understanding it correctly, especially with Apple, it’s actually impossible. What they allow people to build into now doesn’t allow what you want to do. Does this thing fall apart if they say no to you? Rubin: You have to understand this approach. There’s a client and a server. And what Apple has with HomeKit is a bunch of individual consumer electronics companies enabling HomeKit with their products. I don’t know what the percentages are, but they don’t all only speak HomeKit. They speak a whole lot of other stuff as well. And what Apple is trying to do is trying to be the screen that drives these things. And that’s excluding anybody in “Android Land” or Windows from driving those things. So the natural effect will be for those companies to support other products as well, and they’re the ones that are plugging into Apple’s APIs. So the trick that I talked about on stage is: I can produce the same APIs. And I can call it Essential Kit. And those same exact APIs that someone has already developed for their Sonos thing or whatever this point product is, I’m compatible with. Kovach: But isn’t that just another product like Samsung’s SmartThings? Rubin: No, no, no, no. You know what this is? This is [like] Windows emulation [on a Mac]. This is Windows emulation for IoT. APIs for all these people who are building these islands. And if I emulate eight things and turn it on, I control 100,000 devices. Kovach: And have you been able to do that yet in testing? Rubin: I haven’t launched a product. I’m teasing a product, but it’s going to be awesome. These are all forward-looking statements. Question: How far in advance are you teasing? Rubin: We have round LCDs — big ones. What’s after that is basically everything that’s in a smartphone. Right? There’s a bunch of cool things about starting a company today. I have a system in my lobby where I can print badges for people. There’s some startup company whose job it is to do lobby registration now. And when I used to start companies, those guys didn’t exist. But the other thing that happened, obviously, is smartphones have driven the supply base, based on the volume of the component tree of smartphones. And you’ll find those things going into a lot of products like these home assistant products. So it’s kind of a new era as far as leveraging the economies of scale of smartphones into these other products. Question: So Essential Home is a touch interface. Is it also a microphone? Rubin: Yeah it has far-field speech recognition. It has an array of microphones. Question: Is there any plan to add video chat to something like that? Rubin: Really good question. So once you do this job of bridging these islands, you kind of rise above all these other UIs, and you become a kind of holistic UI for every other product that might be in your life. So if you think of it purely from a UI perspective: Who is your UI developer? I actually thing developing for smartphones is too difficult. It’s almost like you have to go to school to learn how to be an iOS developer or learn how to be an Android developer. The good ones have four or five years of experience, and the industry is not that old. So the reason we created a new OS is to basically solve the UI problem and redefine the definition of who a developer is. I want the guy who owns the home to be a developer, in some regard. I can tell you today, there’s a $13 billion industry of Crestron or AMX or Control 4, and they’re drilling holes in your wall and installing screens in your home. That’s an outdated approach. But the guys that are doing the UIs for those are the same guys that are drilling the holes in your wall. There’s this whole installer thing with these high-end homes which is not a mass-market consumer value proposition. So I need to change who the installer is. And I think we’ve built enough technology for a consumer to kind of do a drag and drop. Question: There’s this argument that’s been out there that innovation in smartphones has peaked, that they’ve already gotten so good and can do so many things. Where do you see things going? Where does it go from here? Rubin: When there’s this duopoly with these two guys owning 40% of the market, this complacency sets in where people are like, “Oh what they’re building is good enough. I’ll just go to them.” And that’s the perfect time to start a company like this, when people are complacent and it needs to be disrupted. And the real answer is you guys and the consumers need to tell me if there’s enough new innovation in [the Essential Phone]. I think the 360 camera and the magnetic accessory bus is a pretty good example of the innovation we’re thinking about. And there’s gonna be a string of those things. Let me broadly position this: In the era where smartphones were new and everyone was upgrading from their feature phone to their smartphone for the first time, the product cycle was every six months. There’d be some new thing coming out, everyone’s excited, there was a bubble kind of feeling that you were involved in something completely new and exciting. And then once everybody who wanted a smartphone got one, we’re in a saturated market — at least in the first world. In saturated markets, the upgrade cycle is every 24 months. And the problem with the 24-month cycle, which happens to snap to the carriers’ [ownership] of the consumer, is the consumer doesn’t get to see the innovation. It’s still happening in the background, but it happens every 24 months in these very lumpy onstage announcements. I think there’s a way, and the reason we built this magnetic connector to continuously produce innovation and show it to the consumer happening in real time. It’s almost like software updates for hardware. 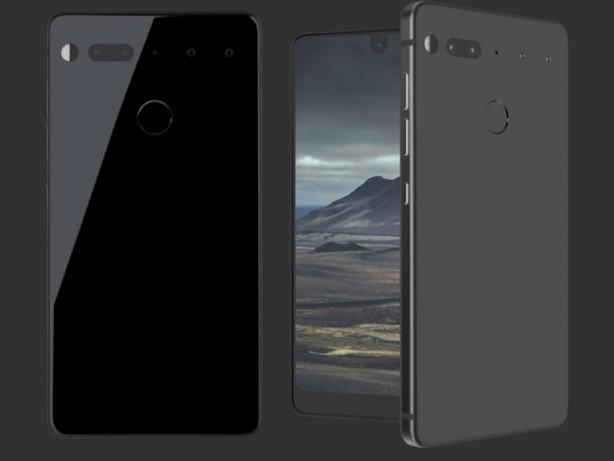 Question: Explain how the Essential Phone is different from a modular phone. From the consumer point of view, it’s, “I’m getting this phone and I can snap a camera on and I can snap on a better battery.” Does it matter if it’s magnetic or not? Rubin: That’s a good question. It’s two things. It’s kind of the core to the way we designed this from a product design perspective. The first one is what’s “modular.” [Google] Ara was the definition of modular, which is you can remove a core component of the phone, like its processor, and replace it with a faster one. We’re not doing that. You buy a phone, the phone works great as a phone. We’re adding stuff onto it. So that’s why I prefer accessory bus as an example. So that’s modular versus accessory. Now, connectors, in my view, are dumb because they get outdated. So a wireless connector is the holy grail. We’re close to that. We transmit power between two pins and everything else is wireless. Actually, the technology we’re using is wireless USB 3.0. So it’s 10 gigabits a second of USB, and we’ve built these transceivers that do that. The benefit of having a connectorless connector is I don’t suffer from what Moto Mod suffered from, which is every phone they come out with in the future has to have that 33-pin connector in exactly the same location so all the accessories you’ve invested in as a consumer still work. So they’ve painted themselves in the corner. They can never change the industrial design of their next phone because it has to match all these accessories. Or they have to trick the consumer into throwing away all their accessories and getting the new one that fits this new thing. A completely wireless thing means I can come out with a phone that’s invisible. And as long as it has this magnetic area on it I can use this legacy of accessories that I’ve purchased. Again, this is a pro-consumer brand. It’s not easy to articulate. We’re trying to do right by the consumer where they don’t have to throw away their stuff every time there’s a connector change. Or get some weird dongle. True story, I went and bought one of those beautiful new MacBooks with the OLED TouchBar. And that’s when they changed to the USB-C thing. And in the IT department in my company I needed to plug in to the Ethernet to get the certificate for the new laptop, and I went to the Apple store and I said, “Do you have a USB-C to ethernet dongle?” And they said, “Oh no we don’t have that yet.” So I had to buy a USB-C to Thunderbolt dongle, and a Thunderbolt to Ethernet dongle. So I had two dongles plugged into each other. And that’s the point where I’m just not feeling too good about being a consumer of those products. Question: Based on the conversations you had today and at the Code Conference, Essential is much more than just a phone company. How do you find that your brand is going to track these consumers? Rubin: It’s anti-walled garden. We chose Android because that’s a big component of that. We have a team of engineers, a lot of them, doing the job of other people to make our products work with theirs. These other companies, especially the walled gardens, they’re sitting here with their ecosystem and they expect people to come to them. And they get to be the toll gate guys and say “yes” or “no.” So we’re actively going out and making our products work with other people’s products because we know that’s how our consumers want to live. Kovach: You spoke a lot on stage today about home and the car as major new platforms, but you didn’t mention AR. What the real question is: ‘What is the end product?’ What is the developer going to build with augmented reality? And so far I’ve seen interactive media… movies and game-like movies, where you’re both a participant and a viewer, which I think is a little too mixed reality for me. There’s a lean back where you’re a consumer of this stuff and it happens, or you’re a participant like a game. The mixed part of it hasn’t been proven yet. One of the problems is the price. It’s just crazy. It’s not ready for prime time. There will be a day where you might have a head mounted display and it costs $199, and you just plug it into your cellphone. And it won’t be ‘I’m wearing this 24 hours a day.’ It’ll be, ‘It’s time to sit down and play Monopoly with the family or something.’ It actually might be more social than what you would do with VR. Question: Is that why you started the 360 camera? Because it’s a taste of that? Rubin: This is all speculation, but I’m hoping there’s going to be a format change in the future. I think I can kind of move the needle a little bit in that format change by taking the world’s largest mass-market product and adding something onto it, rather than trying to create something completely new. So it’s more of a slipstream approach.